I feel that part of my dietry requirements must be to watch all programmes on the Good Food channel. At least once. So next up, on a chilly Sunday evening, was Justine Schofield’s Everyday Gourmet. 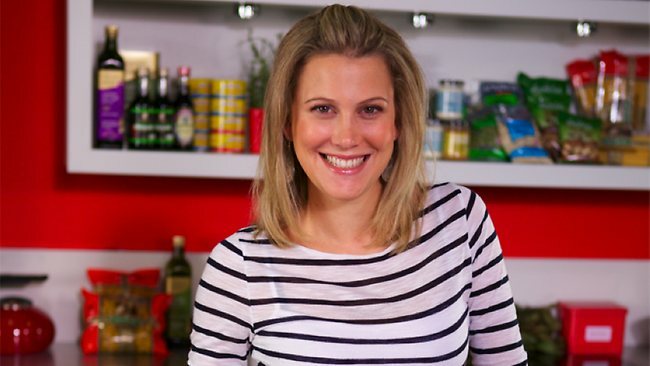 Justine was a popular contestant on the first series of Masterchef Australia and her bright and breezy personality leaps through the echoey kitchen studio into the family homes throughout the country. This is a fast paced, half hour show with Justine donning a new outfit for each recipe and the odd guest or two for company. And a tin of tuna. Many tins of tuna. It’s kind of subtle at first but soon you’re being smacked round the head with tins of the stuff. Did you know that tuna and pesto bruschetta is a very quick and cheap snack? No, me neither. In fact they love tuna so much that they repeat the quick snack recipes throughout the series. After each recipe a caption appears giving details on servings, timing and cost. One thing that intrigued me was that Justine did not sample her final dish. She only eats when cooking with her guest (the WeightWatchers lady or previous Masterchef contestants). I like this idea. In fact, I’m going to write a separate post about it. I was also slightly confused with Tom the butcher’s recipe for slow cooked brisket which involved cooking it for 2 hours having been rubbed with salt and nothing more. Once the meat had been removed from the oven and ‘pulled’ they created a rub (made from the usual cumin, paprika etc), coated the meat in it and fry it for a bit. This was accompanied with flat bread, sour cream and guacamole. No tuna this time.